We loaded up in the rain for the first time. The rain ended as we were motoring out for the start, so that was a nice relief. We were ready and raring to go! There was a light tailwind building, so we would make the start, build some room, and then pop up the chute and start working our way north. We were at the favored end of the line for the start, David cleared a path for us, and then we brought the chute on deck and launched her. Of course, NONE of us noticed that the one we launched was not the light air chute, but the heavy chute. Yikes! 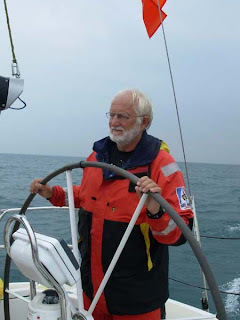 After FIFTEEN minutes of agonizingly slow sailing, George looked at the sail, and asked Don if he wanted the heavy spin up. Madness!! Mayhem!! Here we are, lightly gliding along maybe 500 yards from the start of the most famous freshwater race, the 100th running, and we have to do a peel. Well, George went forward to help set up the shackles with Young David, and it was flawless. The heavy chute just curled back and dropped on the boat. How sweet is that? We passed a few boats as the wind picked up a bit, and then there was a decent wind shift. 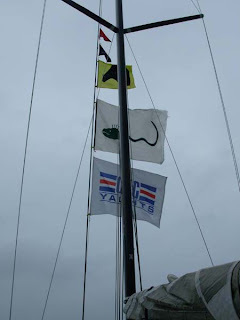 We were ready for it, and with barely a heading change, we set up the #1, dropped the spin, and kept on sailing. Passed a few more boats, and then the faster boats who started after us were coming through. We sailed on through the day, coming across boats from slower sections, passing them, slowly being passed by the larger boats behind us. 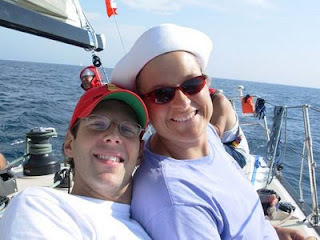 We had a great team, our trim was fine, and we worked the boat and the sails to as much of an advantage as we could. Mackinac, here we come! 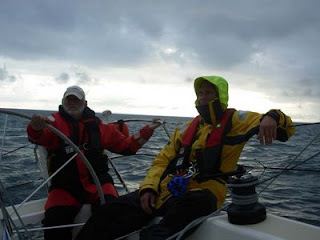 As night fell, we managed to maintain boatspeed, and get some separation from the fleet, and our section. Maintaining boatspeed is of the utmost importance on a race this long. At 2300, Race Tracking shows us being roughly tied for the lead with Bounder and Spitfire. We are closer to Bounder's track, angling slightly low of the Rhumb line. 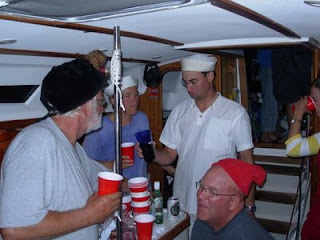 By morning, a little loss of boatspeed during then night had let us fall back to 3rd place. We managed to retain that position throughout the day, sailing through patches of fog into sunlight, then back into fog on Sunday. 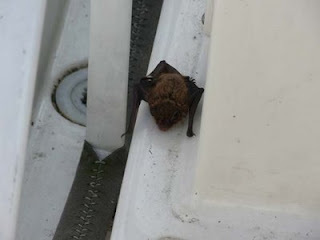 On Sunday, we also had a little visitor, Crazy Bob, the bat (fledermaus, not baseball.) He gave us quite a bit of entertainment as he zipped around the boat, taking a break by hanging on the sail one minute, freaking out Andrew the next by dive bombing him with fly-bys. 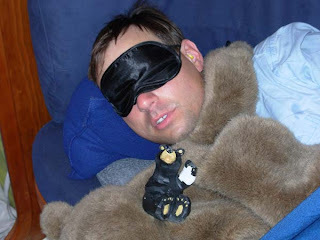 We were pretty sure that if Crazy Bob landed on Andrew, Andrew was going for a swim, so we kept a close eye on him. Andrew, not the bat. Crazy Bob was nice enough to eat a bunch of the flies off of the boat, so that was a good break. 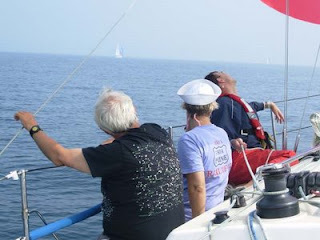 We sailed on on Sunday... only slowing down when Splash took the wheel (it's totally true... he had the poison touch.) Splash would come off shift, the boat would be moving at 3 kts, and then Manny would get on the wheel, and we'd zip up to 6 or 7 kts. Splash took a great deal of crap for that, so let's all make sure he remembers it. Sunday night... this is where we got into trouble. at 2100, we had 7 kts of boat speed, and so did Bounder and Spitfire. They were slightly ahead of us, out of sight, but race tracking lets me know where they are now that I am home, of course. Our plan for the race to to stay a bit high of rhumb for as long as we could, basically just shooting straight for the manitous from the starting line. 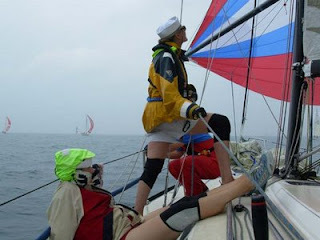 The wind started playing it's flukey game, and we strayed East of our intended course, putting us under the rhumb line. From here on out, our doom was sealed. 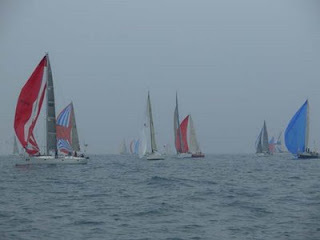 We got trapped in fog and seriously unfavorable winds under Point Betsie on Michigan, and had to beat our way out by almost sailing back towards Chicago. This was very frustrating, as when we were in clear patches of air, we could see lights from boats sailing 'over' us on the rhumb, cruising along, whilst we were trying to get back out to them. If you go on race tracking, and pull it up hour by hour, you can see the leaders pull away from us at that point... very... very.. frustrating. In addition, we were in a serious pea soup fog. 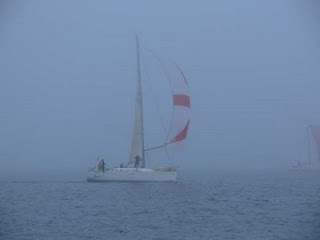 The wind had not died down, we had 7+ kts of boat speed, but we could only see about 50-75 feet in front of the boat. 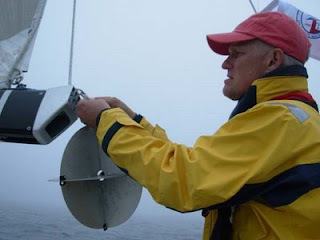 The radar reflector was up for shipping, as we hurtled through the night and early morning. Thankfully, Splash had lost his poison touch, and when he took over driving, we kept our speed up. But we were out of the hunt for the leaders, and now we were just sailing to keep the highest position we could. 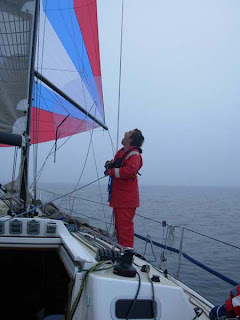 We passed a few boats from the slower section in the fog, but all the warning you would get was a glimpse of a red or green light, and then you had to tack... or jibe... or change course suddenly to avoid a collision. 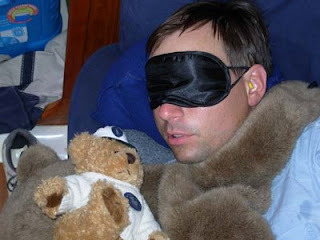 I am pretty sure that some of the boats we passed were only about 20-30 feet away... we went rushing past them, and some of them never saw us... the great Spirit of the Bear was watching over us, and the fleet, as none had a collision that night and morning, even though it seemed like some of the boats were trying quite hard to do just that. Just after sunrise, we found ourselves in full view of Sleeping Bear Dunes, one of the beautiful sights to see. Here is where the race gets interesting. Bounder and Spitfire were ahead of us, roughly the same boatspeed, 5.5 - 6 kts. They never slowed down, but never did we, either. They just had made too much of a small lead when we were stuck below Betsie, and we never caught them. Blue Dog and Paradigm Shift were about 15 miles behind us, and from here on out, the leaders would never really change. As we passed through Manitou Passage, and the day wore on, we were making excellent time, passing a few boats that are actually rated as faster than us. As we made the slight turn to run up to Grey's Reef, we continued accelerating. From here, except for about 5 minutes when Splash was on the wheel (ouch, but can't help it,) we were never below 5 kts for the rest of the race. We were all well fed from Judi's excellent cooking, we had plenty of water, the sun was shining, and we were sailing the boat well. All we needed was for the wind to continue blowing; and it did. In fact, it started howling. 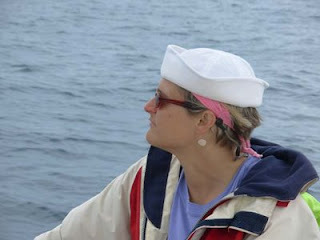 As we entered Grey's Reef, at about 1930, the wind was blowing 18 kts, and it would never get quiet. The rain started, and IT would never let up for the rest of our race. 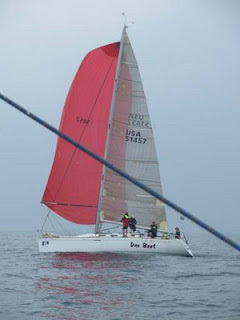 Our boat speed never got below 6 kts from here on out, and we downshifted to the #2. 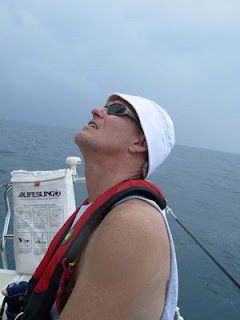 We topped Grey's Reef in a pounding rainstorm, hunkered down on the rain, and got ready for the night. Our boatspeed was up over 7 kts now, with occasional bursts of 8 - 8+5... we were moving, no doubt about it. We had the entire crew on the rail, hiked out, balancing the boat for control. Wave after wave crashed across the bow.. Young David was first on the rail, and over the wind and boat noise, we could not hear him calling out the waves, but we could see them; big waves, coming up over the bow, over David, and crashing into the middle of the rail riders. We were soaked through our foulies. As we made the turn towards the Bridge over the top of Grey's, the wind shifted a bit, still blowing 20+. and allowed us to keep sailing the same point of sail. 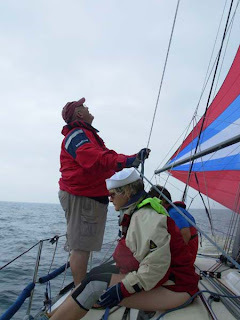 We have crossed the "Green #3" on Monday night before, and finished the race 2 days later... but the weather and winds were headed our way, so we would stay in the weather pattern, carrying it with us, if you will. We started passing boats, some of whom I knew outrated us, but they were heavily overpowered. It was right at the edge of many boats sails, moving from a 2 to a 3, but we were able to carry the #2 and a full main all the way up. If it got over 25, we would have had to reef, but at less than that, we could take the extra power and use it for speed, and we used all we had. We had Blue Dog and Paradigm Shift hot on our tail, although we would not know that until the end of the race. Don passed 10 boats in the 4 hours we were headed east, including 2 from our own section. They would time over us at the end, but passing boats on a close hauled reach is a pleasure, especially when under PHRF, they owe us time. The Magic Bridge was just ahead now... one more stumbling block. It is magic, truly. Many many races have been won and lost after passing the bridge. At 2230, I fully expected to pass under the bridge, and then have the sun come out, the wind shut off, and then drift for 2 days. Thankfully, this went unfulfilled as a dream. 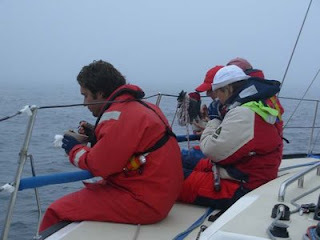 The wind never shut off, and we went rocketing the last 4 miles from the bridge to the finish line, finishing at 2330. We found our spot on the docks, and the dancing began. Whale and Splash did most of the organizing and cleaning up... Got the sails put away, and handed the champagne out. 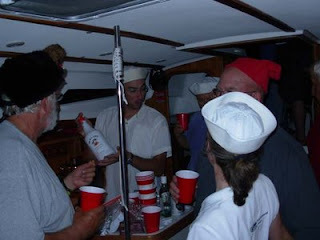 This was Don's 10th Mac, Nicole's 12th, Judi's 9th.. we had some really good experience on the race, but it was time to relax, dance on the boat a bit, meet up with Jean and Nicole, and have some fun. Amazingly, after we finished and as we were tying up, the rain stopped, and it would not rain on us while we were on the island again. It just wanted to make sure we knew who the boss was... and it took DAYS to dry out the boat. We had a great time... none was hurt in the passage, no sails were ripped, and we all had a great time. Ute and Andrew were both thrown in the water, and according to Ute, when asked how the water was, "It's f-ing COLD!" 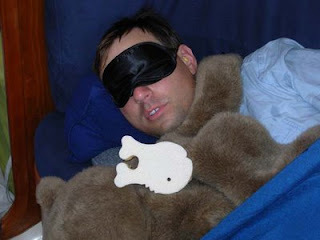 So, the following pictures are sent up unedited, and uncaptioned; supply your own. 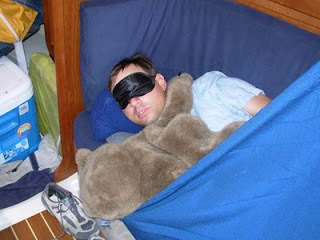 Crazy Bob the bat makes his appearance, and you will get an idea of our life for the 58 hours we were on the water. Oh.. and we were the FIRST C&C 115 to finish. There is something sweet. You have a knack for writing. You should consider submitting that as a story to a sailing mag.